The official McDonald's calorie counter covers only a few nutrients—the ones that are required on food labels. It doesn't list potassium (important for controlling blood pressure and counteracting the high sodium content of many McDonald's foods), folic acid (which prevents birth defects), or antioxidants such as selenium (which combat aging and cancer). It doesn't even report the water content of soft drinks. Many independent calorie counters cover these and dozens of other nutrients that play a role in heart disease, diabetes, osteoporosis, arthritis, and more. An independent McDonald's calorie counter is likely to offer more than just food lookups. Typically, it will calculate a calorie budget for reaching a goal weight on a target date; tally the calories that you get from foods you eat at home and in many other fast-food restaurants; track calories you burn in exercise; and a lot more. 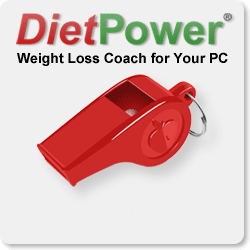 In effect, it acts as a "coach" that guides you to weight-loss success. It's even possible to find an independent McDonald's calorie counter that "learns" your metabolism and adjusts your calorie budget to guarantee reaching your goal on your target date. DietPower does this. DietPower also recommends foods you like (including McDonald's foods) that are best for your nutrition. Sometimes, it will even highlight a McDonald's food as your Smart SecondT—the food that will help your nutrition the most if you double the amount already eaten. Although many independent calorie counters aren't free (typical cost: $20 to $40), you can often try them out for a week or two without paying. In addition, the best counters offer money-back guarantees. In DietPower's case, you don't have to worry about any of this—because our program is completely free.